Life and times of a bead junkie and other things I do with my time. I made this little guy for my boss (at the job that pays me...not the bead shop, since that would be me) for his birthday since he is a huge fan of Donald Duck. The pattern came from a Japanese book that I don't know the title to--not sure if I got the beak quite right, but he's so sweet. About 3" tall. The Boss loved him and was so excited that he actually received something that I made. Hope you enjoy. I have a customer who's requested a Minnie Mouse...I have a book coming and hope that I can create her as well. 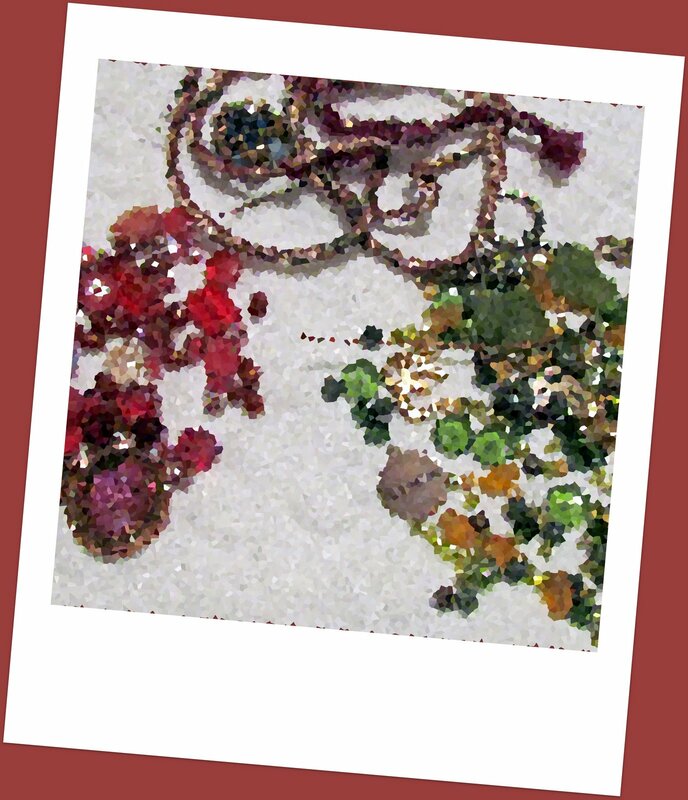 I have to say that except for a few parts, my necklace was finished almost a week ago. 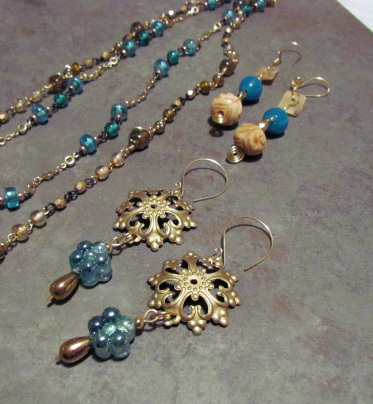 The earrings earlier this week (except for the ear wires which I just made). I did just finish the bracelet last night. I'm normally a silver, sparkly girl, but I've been really getting into MATTE gold. I love the softness of the finish. And then pair that with watery blues and rich browns? You had me at matte. Thank you to our hostess with the most-est...the lovely Lori Anderson. She's set out to host this GINORMOUS blog hop party with 362 participants. Thank you for all the work, Lori! I was paired with the lovely Fiona from England. I opened the package and was so excited to see all the possibilities...there was so much to work with. Thank you Fiona! Your goodies made me sit down and PLAY--normally I work, work, work--so this was a lovely treat! I made 4 pieces of jewelry and still have many beads left over. I usually don't work with crosses...but this one will now have special meaning. More on that a bit later in the post. There was a LOT of little tiny links to make. I used red brass, steel wire and bronze wires. Of course I had to use bits of my lovely matte gold chain. 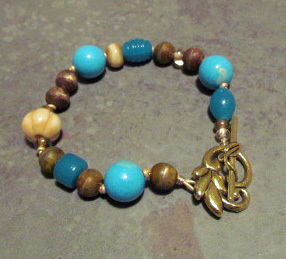 I whipped this bracelet up using .5mm gold leather. It makes a very light weight but sturdy base to the bracelet. I had to make earrings. I'm such an earring girl and with my short hair, I love to show off big earrings. Can't wait to wear these. 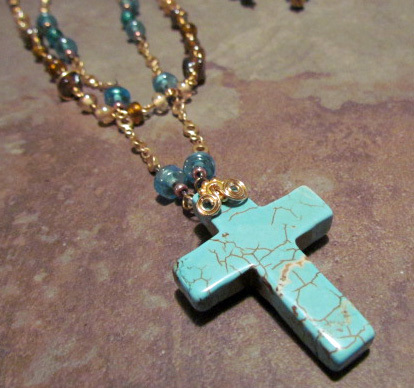 OK..why the cross and the necklace will have a special place in my heart....Tuesday I went in for my biopsy. It's the 1st surgery that I've had since I had my wisdom teeth removed as a teenager. I received my results on Friday, the 1st day I wore the necklace. Great news! No cancer! I will still have to have a full hysterectomy in a short while, but at least no cancer was found. I'm thankful that after all the time of talking to doctors, that someone finally listened to me. I found that I'm in the 4th stage of hyperplasia--which has a 30% chance of turning to cancer. So the big surgery is a preventative measure. I'm OK with that. I don't have children (I have the shop and a four-legged kid) and if I do, one day feel that I need to be a mother, I can adopt. Thanks for reading all that...but that necklace will hold a special place for me. 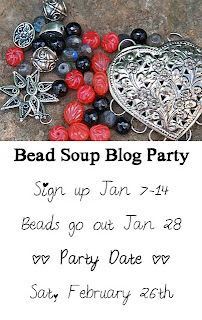 Please visit all the other bloggers who are participating in the Bead Soup Party! Please Click on the link to visit our hostess's website to view the full list. Click on each participants name to view their completed projects. I've been a bad bead soup party partner! 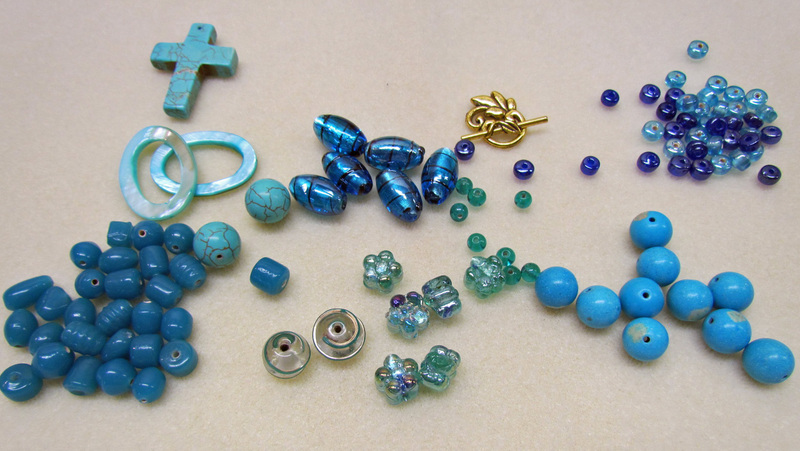 I received my lovely beads from Fiona of Christals Creations and took my pictures but didn't send out a post. I did work on my finished piece over Labor Day weekend--yes, I did play instead of work which is what I do every weekend. Those beads were just calling out to me. I haven't worked on it since then, but it is almost complete! I will finish it on Sunday. Miss Fiona sent me a lovely stash from England. I love the watery blues that she send me and started to formulate my plan.....I'm please with the pieces...yes, I did say pieces--that I've created so far. I've got 5 pieces in the works and will still have lots of beads left over from this bundle of goodness. On Tuesday, I'd appreciate some good vibes sent my way. I'll be having a minor surgery...my 1st surgery since I had my wisdom teeth removed when I was 15. This will then be followed up by the big surgery sometime in October. I will be out of commission for about 2-6 weeks. My surgery will help me, but will throw me into instant menopause. I guess if I'm going to get hot flashes, I'll start getting them when it's cold outside...LOL. I'm in good spirits, but if you think of me on the 13th, send me lots of positive thoughts and light. I'm late (almost late) for a very important DATE! My partner, Fiona Christie, is getting her package shipped out tomorrow. 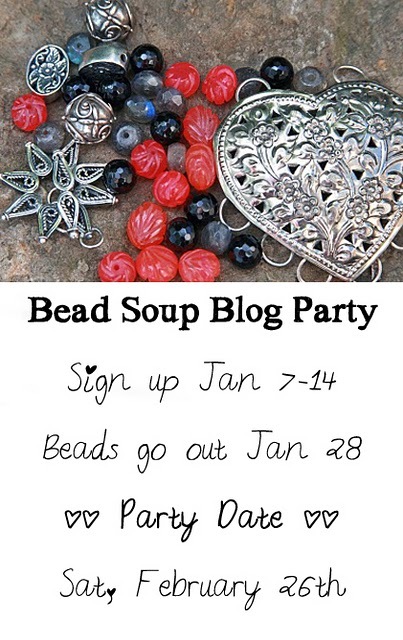 The lovely Lori Anderson is hosting another Bead Soup Blog Party. There are a whopping 362 participants this go round. Hope you visit as many of us as you can when the big reveal date rolls around on September 17. I hope Fiona likes her ingredients. I had fun picking them out! Have you visited the other blogs yet to get a sneak peek of what they've sent to their partners. Whew! It's been a VERY long time since my last post. I won't make the excuse that I've been busy because everyone is busy. I haven't been up to snuff so between running the shop and working my other job I've just been plain old exhausted after 5 years of 70 to 90 hour work weeks. I have some more medical tests going on this upcoming week and I'm hoping that what they find may help solve some of my physical problems and get me creating again. Ok, enough about me personally and on to the BEADS! 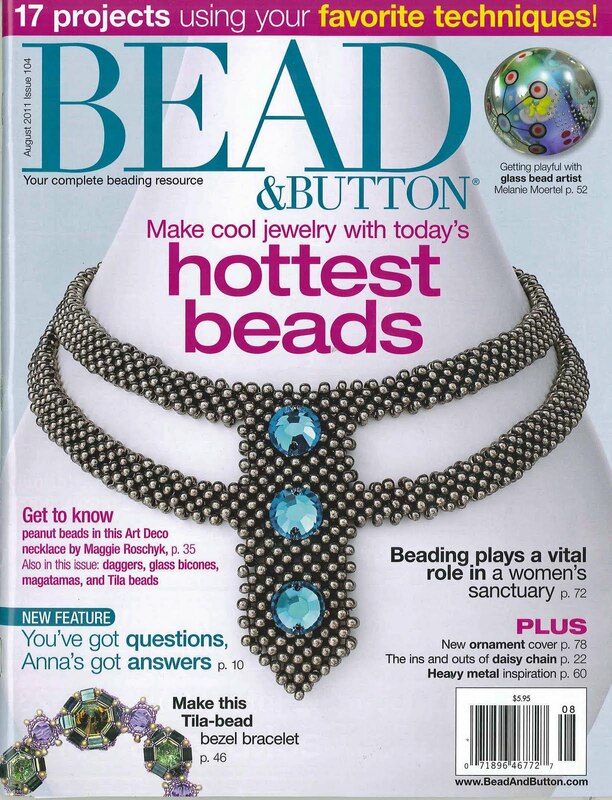 I do have some very exciting news to share and if you have a subscription to Bead and Button magazine, you will have already seen my project. I made the cover (just a small corner, but the cover) after submitting my very 1st stitching piece to the publication. Yep, that's me up there on the left. I have totally fallen in love with Tilas and this idea just popped into my head at the paying job. I'm fortunate that I have a boss who is accepting of the few minutes it takes me to sketch out my ideas on sticky notes! I hope that all has been well in Blogland. I have lots to catch up on in the blogosphere and it may take me awhile! The big day is here! 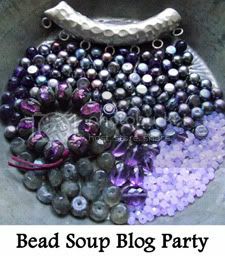 Reveal Day of Lori Anderson's (the Hostess with the Mostest) Bead Soup Party. The roll call on this swap has an AMAZING 210 people in attendance! Can you imagine if we were at a real party? The diversity of style is just incredible and it for sure would not be dull. My blog partner is the talented Serena Trent. Serena took much better pictures than I did for what I sent her and what she sent me...my picture is in the lower right corner. 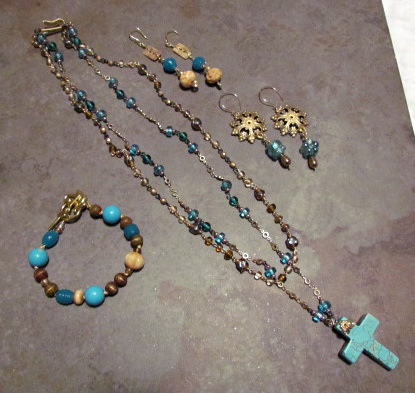 I made three pieces using the beads that Serena sent to me. I made the 1st necklace using one of the bars that Serena made. I drilled some additional holes in the bar in order to hang dangles. Next I added the neckstrap with basic knots using waxed linen (I knew 6 years ago that it would come in handy some day!). I made a wired embellishment on the opposite side using steel wire in 19g and some silver plated wire in 26g. The second necklace I used the focal that Serena sent, I didn't use it with Mr. Bee facing out. I flipped the pendant over and was fascinated with the pattern on the back. 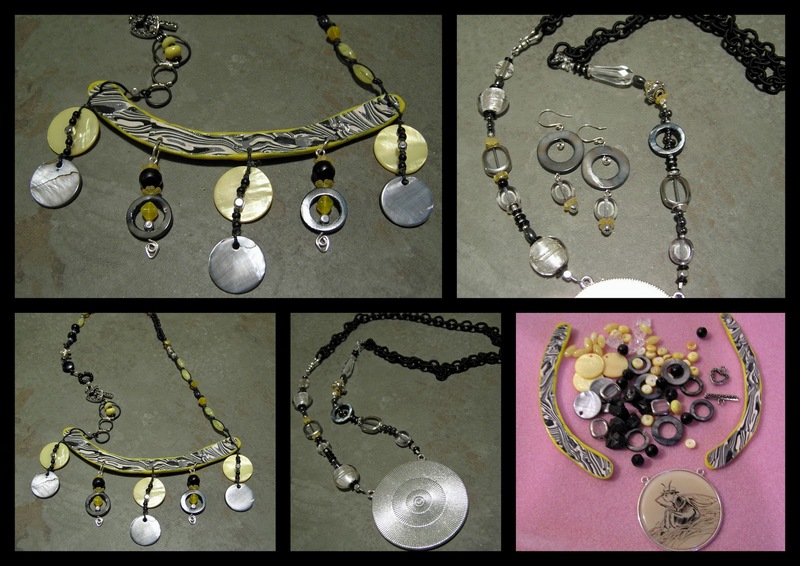 I added various beads in black, silver, crystal, hematite colored glass and a just a pinch of yellow lucite flowers as bead caps. I added a length of polyester chain. I really like how this one came out--I wore it yesterday. I also made a matching pair of earrings. 3. Michelle Heim, Life In the Bead Lane You Are Here! Enjoy the hop around the blog-o-sphere! And THANK YOU for visiting! The countdown begins.... Check out Lori's blog post to see the list to date! It's a HUGE list! Trying to expand my creative abilities. Educating people on my passion--beads--and having fun while doing it!